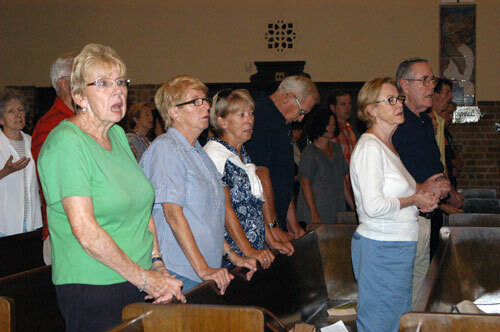 On the 14th anniversary of the Sept. 11 terrorist attacks, dozens of Marine Park residents united in prayer both for the fallen of 9/11 and for Christians today who are suffering persecution around the world. 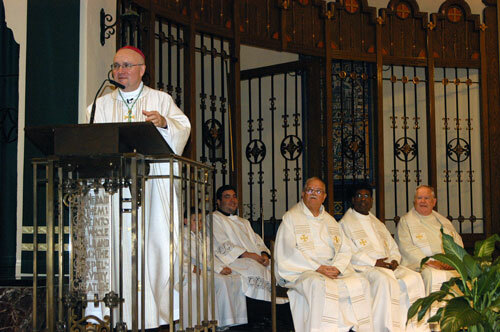 Auxiliary Bishop James Massa, moderator of the diocesan curia, was the principal concelebrant of the evening Mass for Peace at Good Shepherd Church, which lost seven parishioners in the attack on the World Trade Center. Their names were read during the prayers of the faithful. “Sept. 11, 2001 is remembered as day when terrorists took the name of God in vain as they flew planes into the twin towers,” Bishop Massa told the congregation. The Mass was sponsored by the Men’s Fellowship Ministry at the parish, which is spearheading a campaign to raise awareness about Christian persecution around the globe, and call for a greater response by the press and public officials. Concelebrating the Mass were Fathers Thomas Doyle, pastor; Sahaya Justus and Michael McGee, parochial vicars. The bishop, a former weekend assistant at the parish, is also the former executive director of the U.S. Conference of Catholic Bishops’ Secretariat for Ecumenical and Interreligious Affairs. As part of Pope Francis’ upcoming visit to the U.S., Sept. 22-27, Bishop Massa is involved in planning a multi-religious service at the National September 11 Memorial and Museum on Sept. 25. The slurry wall is a retaining wall from the original World Trade Center that withstood the attack, and in doing so, prevented further devastation. It is preserved in the museum’s Foundation Hall. The symbolism of being together in prayer, he explained, is meant to convey to the world that people of different religious beliefs, political affiliations and ways of life can coexist with peace and dignity. “The basis of their religious beliefs becomes a wall of truth against the absurdity of violence perpetrated in the name of religion,” he said. Reflecting on the parable of the splinter and the beam in the evening’s Gospel from St. Luke, the bishop explained that a great irony of religion is that sometimes, people acting in the name of God and faith are blind to their own sinfulness. Nowhere is that more evident than among radical religious factions victimizing Christians in other countries around the world. Parishioner Iyad Alchiek, 30, a member of the fellowship ministry, was invited to speak to that point before the congregation. “It’s very hard to stand here and explain that feeling when you are being persecuted because you’re Christian,” said Syrian-born Alcheik, who came to the U.S. in 2010. 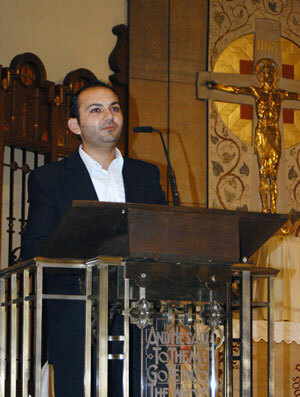 Iyad Alchiek speaks about Christian persecution in his native Syria. 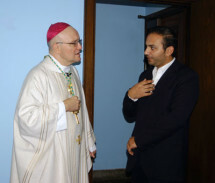 Alcheik said Christians and Muslims used to “live like one family” in his native Maara, a suburb of Damascus. That changed with the rise of the country’s civil war and the Islamic State, he said. He shared the plight of his own brother, who ran with his wife and 3-year-old child in tow when ISIS attacked their town. They’ve settled in Lebanon for now. While the U.S. and other nations are taking in Syrian refugees by the tens and hundreds of thousands, Alcheik said that is not the lasting solution. He appealed to his fellow parishioners to join their voices and encourage elected officials and world leaders to work for an end to violence against Christians. Dennis Waszak, who also belongs to the newly formed ministry, said its 27 members chose to focus their efforts on Christian persecution after reading about the issue in The Tablet. Sheila Hanley, a longtime parishioner, said she would definitely sign the petition. “I have a tremendous faith and I understand about Christians being persecuted,” Hanley said.